Above Right: At the panygiri Nine days after Tis Panagias. From the left are: her mother, Konstantina- holding me; mu auntie, Wleni Vourgoutzi; Elpiniki Karapanagiotou; Sophia Dimitriou; Efstratia and Stelios Hondros; my father, Menelaos and his cousins, Giorgos, Lefkothea and Aertmis Koutilellis; my uncle, Stavros Vourgoutzis; and Athanasios and Fotini Vourgoutzis. Next to them- at the bottom right corner of the photograph- is Maria Stavroudelli. 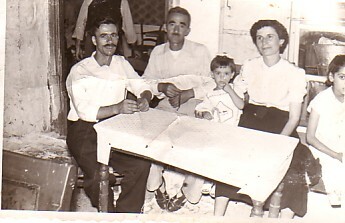 Above: With my parents, Menelaos (left) and Konstantina, and my godfather, Vasilios Moutafis (middle). Above: With my father, Menelaos, in our butcher shop (in Stypsi). Above Right: Dancing with my husband, Efstratios, and my sister-in-law, Elvira (right).